Marge: Homer, didn't you get any milk? All I see is egg nog. Homer: 'Tis the season, Marge! We only get thirty sweet noggy days. Then the government takes it away again. 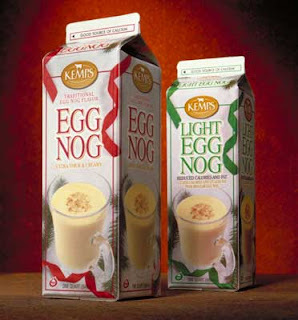 Honestly, I have no idea why I like egg nog so much. I can't even describe how it tastes (it's, uh, creamy, and, um, nutmeg-y...?) but I loves it. Maybe it's just because, as Homer suggests, that like the Bacon Club Chalupa, Cranberry Splash Sierra Mist and Frankenberry, we can only have it for a limited time before it gets taken away again. have you ever had the alcohol version? I hope you do a post about snowflakes or snow related content as I have a grievance I would like to air. Ditto, and tell me about it. Oddly enough, considering I like booze and egg nog, I have not. I really should some time. Oh, good to know. I will have to pick some up as well. 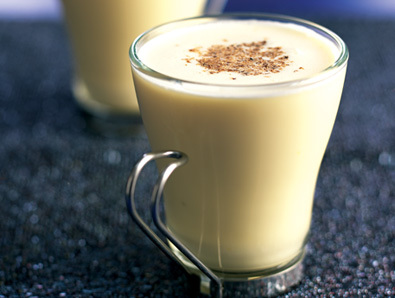 ooooh, organic egg nog, you say? On it. I recently picked up a giant carton with Sam and he looked at me all wide-eyed. "you're not going to drink all that are you?" my reply, "i most certainly am. It's only once a year, dude! Tis the season and all that crap." mmmm, I wish I had some here with me at work. @Hannah: I recently picked up a giant carton with Sam and he looked at me all wide-eyed. "you're not going to drink all that are you?" my reply, "i most certainly am. It's only once a year, dude! Tis the season and all that crap." It's like Christmas music. Gotta fit a year's worth of nog into one month.